A thousand-year-old secret room. A sultan’s stolen treasure. A missing French priest. And an invitation to Paris to rekindle an old flame…. Historian Jaya Jones finds herself on the wrong side of the law during an art heist at the Louvre. To redeem herself, she follows clues from an illuminated manuscript that lead from the cobblestone streets of Paris to the quicksand-surrounded fortress of Mont Saint-Michel. With the help of enigmatic Lane Peters and a 90-year-old stage magician, Jaya delves into France’s colonial past in India to clear her name and catch a killer. 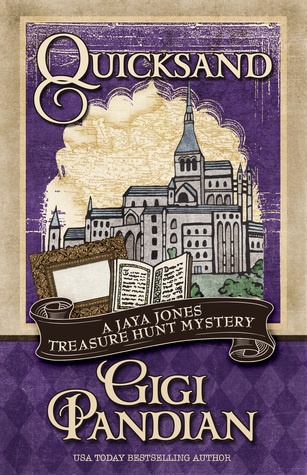 Quicksand is the third book in Gigi Pandian’s Jaya Jones Treasure Hunt Mysteries series. It’s the beginning of the school year for history professor Jaya, but a mysterious invitation to Paris quickly captures her attention and pulls her away from her San Francisco university. But as soon as Jaya arrives, it’s quite clear that all is not what it seems. What I like so much about this series is how they are really more of adventure stories than a mystery. Oh, sure, there’s mystery involved, but the main plot is tied to history and lore and long lost buried treasure. Each story, Quicksand included, has an air of excitement, a thrumming undertone of action that propels the reader into the story and pulls her through chapter by chapter. As I continued to read, I periodically set aside my book so that I could look up the Mont St-Michel and the The Machines of the Isle of Nantes. I sped through the final chapters with a determined resolve to figure out the mystery and who, exactly, was the mastermind behind it all. While the title may refer to the sand found on the Mont, it could just as easily be an indicator of the book and the story itself. Once Gigi Pandian gets a hold of you, consider yourself stuck and sinking fast into the quicksand of her superb storytelling. My thanks to the good hens at Henery Press for providing me with a free copy of Quicksand in exchange for an honest review.